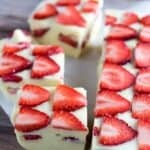 White Chocolate Fudge with Strawberries is a really simple fudge you can make in the microwave. Sweet white chocolate and condensed milk melted together and topped with fresh strawberries. It’s the perfect Valentine’s Day treat! If you’re looking for a really easy treat this Valentine’s Day (or, you know, any random day), look no further. White chocolate fudge with strawberries is super easy to make! All you need is a microwave and a dish to let it set. That’s it! And as an added bonus, this recipe is only 3 ingredients. I happened to have everything in my pantry already, so you may be able to pull this one out for times when you have surprise guests show up. Perfect! 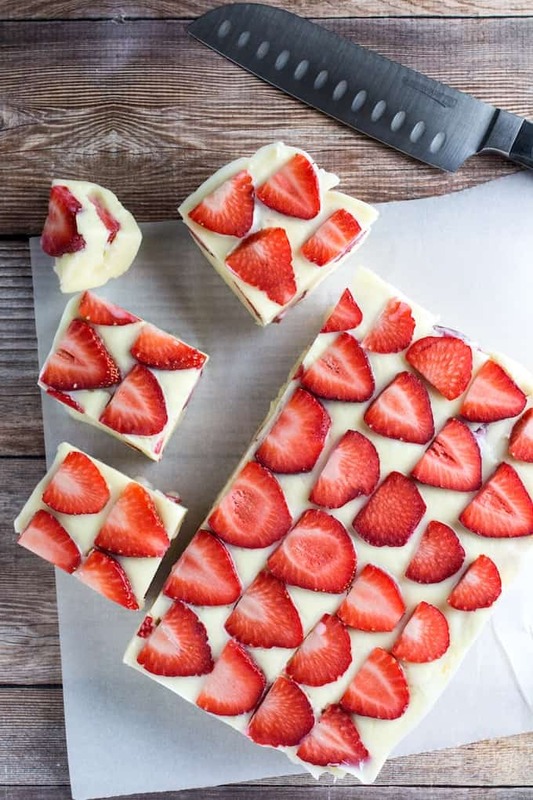 Did I mention how incredibly easy this white chocolate fudge with strawberries is to make? Seriously, with only 3 ingredients, all you need is a microwave. You could also make this on top of a double boiler (or in a sauce pan, but only if you have a really good quality metal, otherwise it’ll probably burn). Personally, I prefer the microwave. It’s just super easy to do, and you don’t have to worry about as much cleanup afterwards. Win! White Chocolate Strawberry Cheesecake – This one takes a bit more effort, but it’s totally worth it! Chocolate Mug Cake – This is another microwave dessert that only take a few minutes to make but will take care of a chocolate craving in a pinch. Easy Chocolate Chia Seed Pudding – This one is for when you’re craving chocolate pudding, but you’re also kind of craving something healthy. It’s the best of both worlds! Nutella Chocolate Chip Cookies – Because who doesn’t love Nutella, am I right? 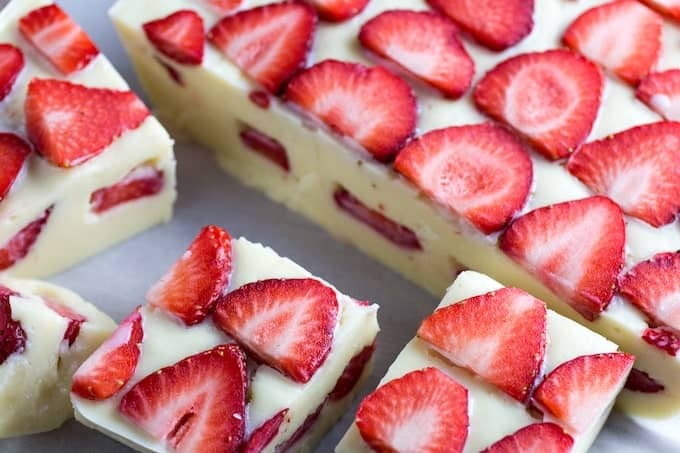 White Chocolate Fudge with Strawberries is a really simple fudge you can make in the microwave. 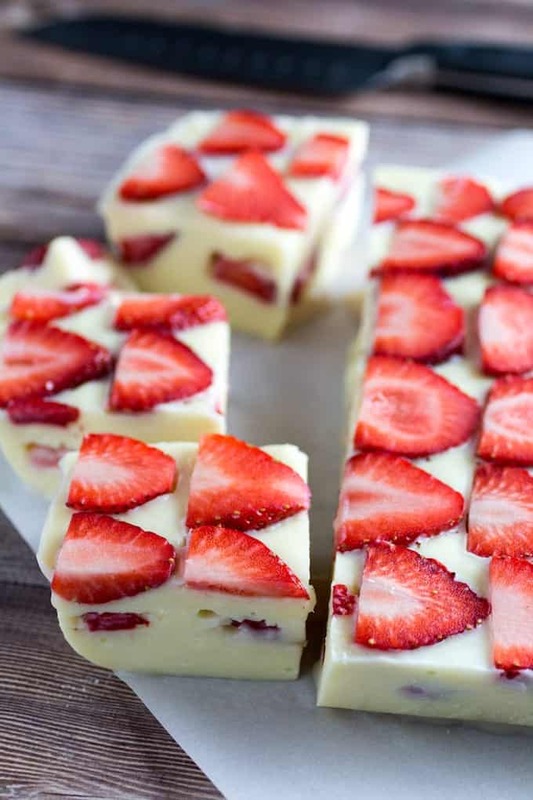 Sweet white chocolate and condensed milk melted together and topped with fresh strawberries. It's the perfect Valentine's Day treat! Add chocolate chips to a microwave safe bowl. Microwave 1 minutes, stir, and microwave 1 additional minute. Repeat until chips are mostly melted. Stir in condensed milk until all ingredients are well mixed together. Microwave an additional 15-30 seconds if needed. Line a baking dish (8x8-inch or smaller) with parchment paper. Pour half of chocolate into pan. Add layer of sliced strawberries, and pour rest of chocolate into dish. Top with another layer of strawberries. Refrigerate 1-2 hours, or until fudge has hardened. Cut into squares and serve. Previous Post: « Slow Cooker Mongolian Beef – Gluten Free!